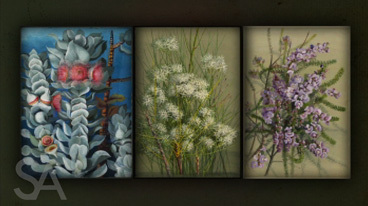 Video clip synopsis – Victorian flower painter Ellis Rowan rocked the Australian art establishment when she won the Centennial Art Prize in 1888. Broadband MP4 flowerhunter_bb.mp4 (19.1MB), suitable for iPods and computer downloads. Victorian flower painter Ellis Rowan rocked the Australian art establishment when she won the Centennial Art Prize in 1888, defeating established male artists including Tom Roberts and Frederick McCubbin and prompting a complaint from the Victorian Art Society. A feisty and tenacious adventurer, Rowan travelled Australia searching for rare and exotic species to paint before venturing into the jungles of New Guinea to find inspiration for her exquisite flower paintings. Using watercolours and gouache on coloured paper, she painted many unique varieties, on one occasion claiming to have dangled by a rope over a precipice, hundreds of metres above the rainforest below, to paint a tree orchid. The bitterness of her male rivals lasted until well after her death in 1922. Some 900 of her watercolours are now in the National Library collection. Ellis was a contemporary of Tom Roberts and Frederick McCubbin—both of whom are considered to be important in the development of Australian nationalism in the late 19th century because their art focussed on typical Australian scenes. How might you argue that Ellis Rowan should also be considered part of this nationalistic development? The main women given acknowledgement in Australian history are those who achieved political rights for women or writers. Research and prepare a list of notable women. Include, but try to expand your list beyond, political activists and writers. Ellis Rowan was not typical of women of her day. Suggest or speculate on what obstacles might have existed for women to be independent travellers and artists during Ellis’ lifetime. Then research more about her life to test these ideas and to see how she overcame these restrictions and limitations. Summarise in just one or two sentences why these paintings are ‘treasures’ in our knowledge and understanding of aspects of Australian history.